“Fika” is Swedish for a coffee break that’s more about socialising than drinking coffee. It is a legitimate reason to set aside a moment for quality time. And something sweet is also welcome. To create an accessible alternative to unhealthy foods and an inactive lifestyle, we turned to four of Sweden’s Michelin-starred chefs. Together, we transformed the whole country into a do-it-yourself gourmet restaurant. Because in Sweden, delicious healthy food is just around the corner – in our nature. Welcome to Sweden, now open for reservations. New for 2018 is that Visit Sweden & our Swedish partners will be a three minute stroll away from WTM at the Swedish Matchmaking event! We will offer you the opportunity to meet with our partners from Sweden, try mouth-watering Swedish food and participate in interactive learning about the Swedish lifestyle, culture & destinations. After a busy day at the Swedish Matchmaking event we will whisk you away for an evening of Swedish gastronomy, which of course includes both dinner, beverages and plenty of fun and learning! Our ambition is that Swedish Matchmaking will increase your knowledge of Sweden as a tourist destination and be the start of new and productive business relationships for you. Swedish Matchmaking offers an excellent opportunity to experience the Swedish lifestyle as well as meet tourism industry representatives from the local regions in Sweden. This invitation is aimed at a senior product managers, responsible for new product developments. Sweden is the world’s most reputable country in 2018. According to the Reputation Institute’s annual Country RepTrak® study results, Sweden is the most open and progressive country among the 55 countries covered by the survey. Sweden is the world’s most reputable country in 2018. According to the Reputation Institute’s annual Country RepTrak® study results, Sweden is the most open and progressive country among the 55 countries covered by the survey. A big part of Sweden’s excellent reputation is down to their friendly and welcoming citizens. The beauty of the country, with its captivating landscapes and accessible nature, also receives great scores and attracts tourists from all around the world. Sweden has regained its top spot in the ranking, an accomplishment previously achieved in 2016. The survey measures how countries are perceived and respected worldwide. Thisadds to the country’s attraction among tourists, who want to visit destinations with a good reputation, as well as foreign business and investments. In this year’s ranking, Sweden is followed by Finland, Switzerland, Norway and New Zealand. Sweden received the highest marks for being the most ethical country, as well as having the most progressive social and economic policies. The reasons can be explained by the view of Sweden as one of the world’s most gender-equal countries, as well as being at the forefront of technological innovation. “I am convinced that this result stems from the fact that our social model creates not only growth but also freedom, equality and security. More and more people understand that inequality is a major obstacle for economic development in the world,” says Prime Minister Stefan Löfven. With its variety of landscapes, dominated by lush forests, more than 100,000 lakes, and with 97 percent of the land uninhabited, Sweden obtained thehighest marks for its beauty. In combination with vibrant cities like Stockholm and Gothenburg, this makes Sweden the perfect destination for people looking for a beautiful and enjoyable destination to visit. “It is gratifying to see that Sweden ranks number one as the most reputable country. Especially with characteristics such as being a welcoming and progressive country. For being such a small country, a lot of creativity, design and technology comes from Sweden –just look at IKEA, Spotify and H&M. It really shows that our ways of living make a mark globally and gives reasons for tourists to come visit our country,” says Ewa Lagerqvist, CEO at Visit Sweden. An appealing environment, a country “feel good” factor and a perceived pursuit of happiness are key to a country’s success, according to the survey. This is something that Swedes know well, as the country achieves excellent scores in being an enjoyable country with an appealing lifestyle. Each year, The Reputation Institute surveys thousands of people to find out which nations are perceived as most reputable. The Country Rep Trak ranking measures the 55 largest countries by GDP and the outcome is based on individual ratings from over 58 000 individuals. Sweden is reinventing itself as a food destination and experience. From high quality restaurants to bistros, bars, gastro-pubs, cafés and other eateries, there is something to suit every wallet and purse size. 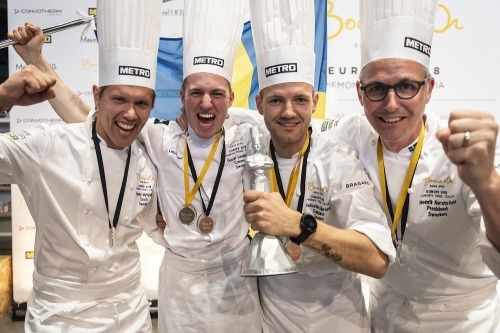 This 'food revolution' was exemplified in June 2018 when 29 year old Swede Sebastian Gibrand and his coach Tommy Myllymäki, along with the team commis, Gustav Leonhardt, won silver at Bocuse d'Or Europe in Turin, Italy. Denmark came in third and Norway won the gold medal. In total 20 nations were competing and the top ten qualify for the world’s most prestigious competition for chefs, Bocuse d’Or Finale in Lyon 2019. · - Now it’s time to just enjoy this and celebrate after Sebastian’s fantastic effort. The journey to get here required an enormous amount of preparation and training so this is an amazing reward. Now it’s time to focus on creating the tastiest dishes in the world for Bocuse d’Or Finale in Lyon, says Tommy Myllymäki, who has himself won both bronze and silver previously in Bocuse d’Or. Sebastian Gibrand’s creations Ljusa Sommardagar (Light Summer days) served on a plate, as well as Varma Sommarnätter (Warm Summer nights) served on a platter was made, in accordance with the rules, for 15 people each. The plate presentation consisted of hen egg with herbs and garlic, Castelmagno-cheese, crispy potato, butter and olive oil emulsion, charcoal scented zucchini and Albenga asparagus. The platter consisted of Fassone-beef fillet, sweetbread, roasted summer vegetables and a Sant Andrea rice ragu. Sebastian Gibrand believes that the best flavours will come through in his cooking when he is innovative in his choices and trusts his intuition. He is inspired by architecture and design, evident in his distinctive presentation. Both dishes that lead to the medal were prepared in 5 hours and 35 minutes, and were presented to a different jury for each dish. More information about the produce and competition rules, as well as info about the Swedish team can be found in the info sheet. Sebastian Gibrand is originally from Helsingborg but has lived in Stockholm for many years. He has previously worked at Oaxen Krog & Slip and Studio Franzén. Since 2011 he has run his own consultancy, Gibrands Gastronomi in Stockholm. This online directory makes it easier than ever for international travel trade members to work with Visit Sweden. The catalogue provides users with 24/7 access to the latest updates and information from Sweden’s top destinations, hotels, activities, museums and more. Products can be searched easily and by region, season or type of activity, delivering a full product description along with practical information. Currently, the online catalogue contains over 600 tourist products from 10 destinations around Sweden, with new products and destinations being added almost every day. Information is shared in both an online and pdf format containing descriptions and images, as well as opening hours and booking guidelines, with the option to download, share or copy a link to a product or destination. Users can also opt in to receive email notifications, providing regular destination updates. Sweden is listed as a destination to watch in the ABTA Travel Trends Report 2018. The sense of well-being offered by the Swedish lifestyle has a great appeal for UK travellers. Visit Sweden and its regional partners are organising fully inclusive fam trips to Sweden in 2018. These trips will be on individual basis so you as a tour operator can request specific dates and request a tailor-made itinerary that will suit you and your business. Our ambition is that a customised fam trip will increase your knowledge of Sweden as a tourist destination and be the start of new and productive business relationships for you. We hope this will increase and improve your product portfolio of leisure experiences in Sweden. The fam trip offers an excellent opportunity to experience the Swedish lifestyle as well as meet tourism industry representatives from the local region. The trip is aimed at a senior product managers, responsible for new product developments. If you are interested in extending your Sweden portfolio and exploring this destination further, please contact Gabriel Dorch at gabriel.dorch@visitsweden.com for a useful teaser on which to build your own itinerary. This is the official image bank of Sweden. These images can only be used when presenting Sweden abroad. All Swedish travel products in one place!